In few days we're releasing new Flight Manual with some new limitations (together with a SB). The placard must be anyway re-done, we can supply you with the new one as soon as approved officially. You'll find everything online @ tech page on our website"
Anyway, first I had heard of an upcoming revision to the POH and limitations or an SB. So what are the new operating limitations? dstclair wrote: So what are the new operating limitations? Won’t know until they are released. Fingers crossed! Eddie, as the owner of an E-LSA, the new operating limitations will not apply to your airplane anyway. Your operating limitations remain the same as issued during your E-LSA conversion process. MrMorden wrote: Eddie, as the owner of an E-LSA, the new operating limitations will not apply to your airplane anyway. Your operating limitations remain the same as issued during your E-LSA conversion process. Is that correct? IDK. What if an aircraft manufacturer discovered some severe deficiency and issued a limitation such as "aircraft cannot be operated at more than 1100 pounds max gross weight"? Would an airplane that had been converted to ELSA be able to ignore that new limitation? I was actually pondering this a few hours ago. I suppose, as an Experimental, I am free to determine my own Vne, for instance, or any other limitation other than those which would take the plane out of the Light Sport Limitations. And worth mentioning that Vne is not mentioned in my Experimental Operating Limitations, nor are most or all of the Limitations on the placard. But in any case I certainly would want to know what Limitation(s) the manufacturer may have deemed to change. For what I think are obvious reasons. 'be able to ignore' dumb to do but even the SLSA owners could ignore. the converted plane is subject only to its limitations. What are you saying? An ELSA owner can legally ignore new limitations or not? TimTaylor wrote: What are you saying? An ELSA owner can legally ignore new limitations or not? An E-LSA, whether originally manufactured that way or converted from an S-LSA, is only bound by LSA definitions and its operating limitations. New operating limitations are issued at the time of a conversion, and the manufacturer’s limitations are no longer in effect. The manufacturer no longer has any authority to mandate any maintenance, procedure, or limitations on the airframe. I’m pretty sure the FAA can still issue ADs on E-LSA, as they did for the Zodiac 601XL on an emergency basis a few years ago. I am not suggesting that an E-LSA owner ignore SBs or other guidance from the manufacturer; I’m just pointing out such guidance is not binding on an E-LSA and there could be a situation where an owner felt the need to go against such recommendations. 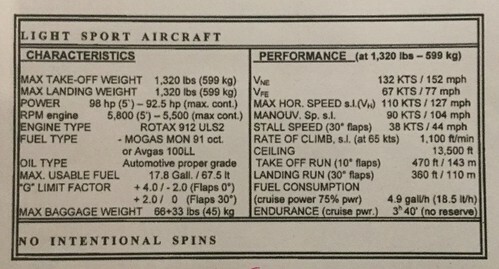 A Service Directive issued by the manufacturer is required on an S-LSA, service bulletins are not. The term used in the applicable FAR is Safety Directive. That has the same force of law as an AD would for certified aircraft. Thanks for the terminology correction. So this Service Bulletin http://www.sting.aero/owners/notices/TL ... 202015.pdf is basically advisory and does not require compliance’s to keep the plane airworthy. Am I reading it right ? Well, since the Service Bulletin doesn't specifically say Safety Directive, it doesn't have the same force of law as an AD. However, I see at the top of the document the words "Notice of Continued Airworthiness." Any Maintenance requirements specifically mentioned in the Continued Airworthiness section of an approved Flight Manual are regulatory. So, even though the SB isn't mandatory, if the manufacturer incorporates it into the Continued Airworthiness section of the AOI, it then becomes a requirement. And , as always , thanks for your help and expertise.